Journey Found Inc. an organization that provides support services to adults with intellectual and developmental disabilities, will host a 5K event in South Windsor on May 21. They have reached out to invite members of the Goodwin community to participate. Register at www.journeyfound.org. Questions: Monica Carr at 860-643-9844 x 137. Join us for a variety of activities designed to relax your mind and body, reduce stress, and bring happiness and balance into your life. 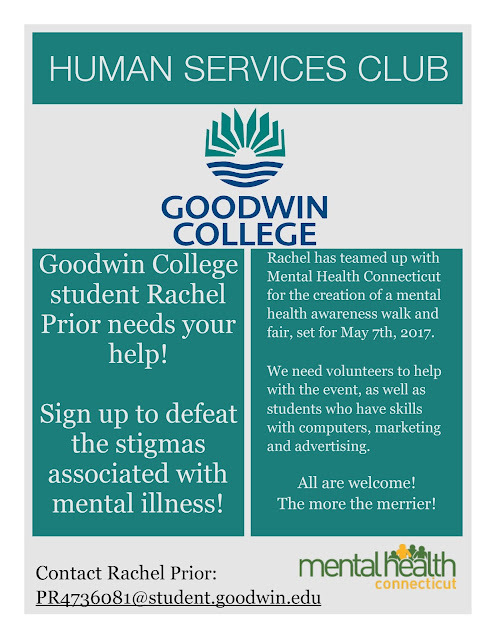 Move out of your comfort zone and try something new and potentially life changing during Goodwin College’s Health and Wellness Week. We will be kicking off the week with a Health and Wellness Fair on Tuesday, April 4, from 11 a.m. to 2 p.m. where you can chat with health and wellness vendors, try food and drink samples, win prizes, get a massage, and much more! 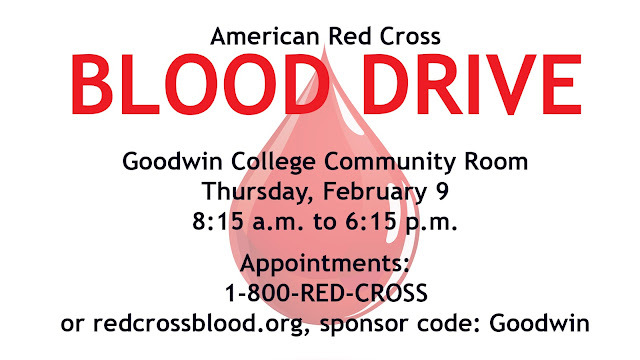 All activities will take place at the River Campus and are FREE and open to the community. Stay tuned for more details. 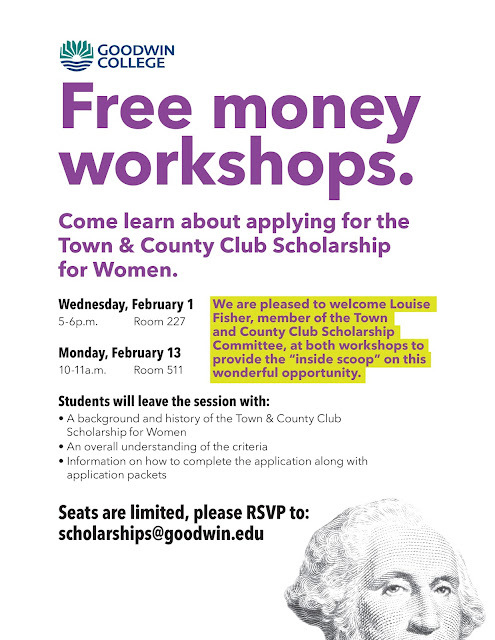 For questions, please contact Vanessa Pergolizzi, Student Engagement Coordinator, at vpergolizzi@goodwin.edu. Please be aware of two events that may impact travel at the main campus. Monday, 1/23, and Tuesday, 1/24, Pratt & Whitney will host meetings of several hundred guests using the Auditorium, Community Room, and 195 Riverside. 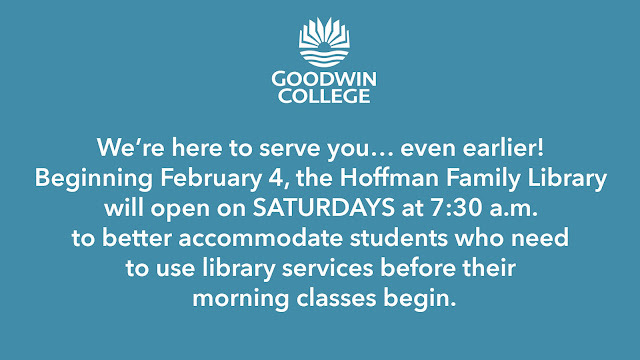 Goodwin students and employees are encouraged to allow extra time for parking and foot traffic around the buildings. 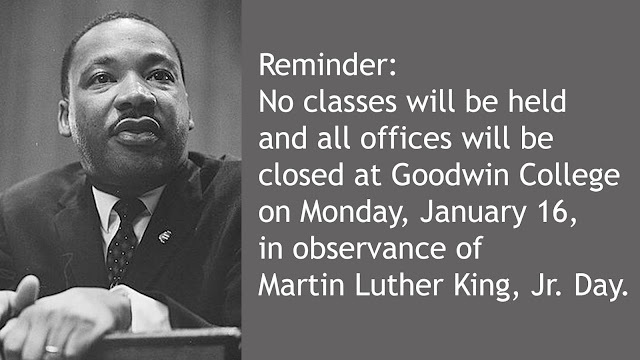 Due to expected inclement weather and poor conditions, Goodwin College will close at 4 pm on Tuesday, January 17. The CT Private Well Task Force and the CT Department of Public Health and their cooperative agreement with the National Center for Environment Health of the U.S. Department of Health and Human Services Centers for Disease Control and Prevention to reduce drinking water exposures will host a CT Private Well conference on March 23 in the River Room at 195 Riverside Drive from 9 a.m. to 3 p.m. Registration is at 8:30 a.m. and admission is free. This conference will address private well water contaminants, related health issues, private well water treatment options, and related technical topics. The conference is open to individuals who work in a field related to private wells or are interested in learning more about private wells (local health professionals, well and plumbing contractors, home inspectors, building officials, environmental lab professionals, etc.). Additional details regarding agenda and registration will be forthcoming. Please save the date to attend. Questions: Tiziana Shea at Tiziana.shea@ct.gov. The Calculator Loan Program offers students who are enrolled in college-level math, statistics, or science courses the opportunity to borrow a calculator for a semester at no cost. Students will have the option to borrow a TI-83 Plus for statistics or a TI-30X for college-level math or science courses. Calculators are limited in quantity and are distributed on a first-come, first-served basis. Students wishing to borrow a calculator will need to complete the online request form athttp://www.goodwin.edu/forms/calculator-loan/, also located on the Academic Success Center webpage under the Math Lab. Once the request has been received and processed, an email will be sent to your student email regarding whether there is a calculator available and/or when the calculator will be available for pick up. Please note: Students will no longer be allowed to walk in to the Math Lab to request to borrow a calculator.